Today, I have two layouts to share!! The first, is for Sketch Support and the fun Nikki Sivils cross promotion we are doing this month. The second is for our newest Fabulous Friday challenge at Frosted Designs. We were given the choice at Sketch Support, to choose from the 4 new CHA-W releases of Nikki's new lines. I chose to work with the Audrey collection, since my number of girls outweighs the number of boys that I have. :) This is such a fun line and I love the colors that Nikki put together with this one. I decided to use the sketch pretty much as is. 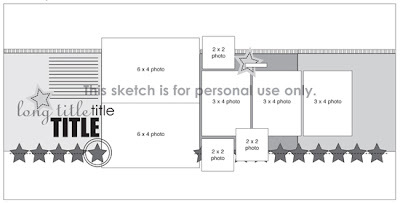 The layout is based on the Two Page sketch #28, which I did another layout with earlier this week. You can see it here. I had fun fussy cutting a lot of elements from the patterned papers, to use for the banner across my layout. This line ended up being totally perfect for the photos from our girls' double birthday part at Build-A-Bear. Today also kicks off a new Fabulous Friday challenge at Frosted Designs and this week we are asking you to add LACING to your layouts or projects. Now, don't let that scare you...it's not as difficult as it may sound! Here is what I did and make sure you head over the FD Blog to see how the other DT Ladies took on this challenge. I dug into my stash of October Afternoon goodies for this layout. It's mostly just a mix/match of their products...I love the way all of their lines coordinate so well together. For my lacing, I just used some baker's twine and added a little bit of the lacing to my title letters. I thought this would be a great way to emphasize the title and subject of my layout. 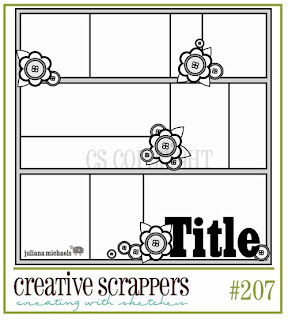 I also used an awesome sketch from Creative Scrappers this week. Check out Sketch #207 on the CS Blog this week! So make sure you come play along this week at Frosted Designs, for the chance to win an awesome prize from our sponsor this week, One Stop Card Crafts. Both of these are awesome- but I must say the "rope" treatment you've done on the Ropes part of your title in the second one is...GENIUS!! You have been busy! I saw your rope layout on Frosted Designs this morning and loved it right away! You always do a great job with the challenges! That October Afternoon paper is so pretty... Some of my most favorite colors! And your other 2 page layout is wonderful! I love the picture of all the girls at the end with their bears! Wowwwwwwwwwwwwwwwwwww! These are both gorgeous! You rocked the Audrey line... and love love love how you stitched on the "ROPES"!!! These are amazing! A terrific double with sweet vibrant papers! Love the single LO!! A lovely palette and I love all of your stitching! I haven't stitched on alphas in ages. Got to do that again!! I double! Very cute one too. I love the rope lo! oooh I love what you did with that creative scrappers sketch! I haven't done that one yet! Great job with the lacing on "ropes" too cool! Love the double pager! When I saw your blog post title in my blogger dashboard, I thought "Whaaaat? Ashley and a two-pager??" Great take on the sketch. And I just love Nikki's stuff! I have only used a couple of her lines but they are so 'easy' to use! Love the lacing page too! The sewn baker's twine is just adorable!